This type of question is similar to match the following type question but with a drag and drop interface. In this question type candidate must arrange the option given on the left in correct sequence on the right . User has to drag each left element to the correct spot on the right. 1. 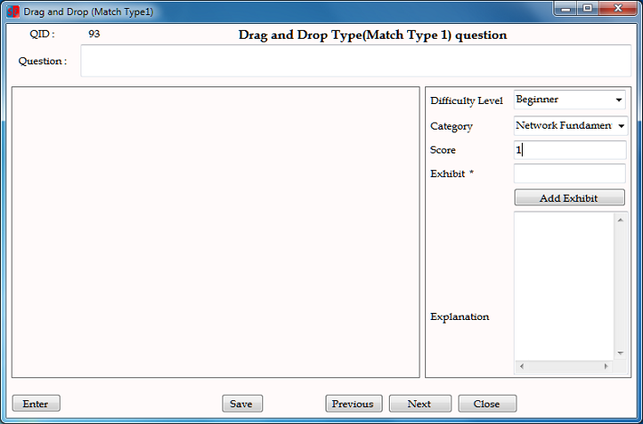 Entering a new question : To enter a new question select "Drag and Drop Type3 (Text based2)" under "Choose Question Type" in Author/Question Type screen and click on "Add New/Insert". 1. Question : Enter the main question in this field. Enter the Question and Answer options (Make sure answer option are entered in correct sequence on the right). 4. Difficulty Level : Use this option to select difficulty level for the question to Beginner, Intermediate or Expert. Default value is set to Beginner. 5. Category : Use this option to assign this question to a specific category (topic). By default first category is selected. 6. Score : This field shows the score assigned to this question. 7. Exhibit : This option displays the name of the image file selected by browsing. 8. Explanation : Any explanation for the question can be entered in this field. 2. Edit an existing question : To edit an existing question select select "Drag and Drop Type3 (Text based2)" under "Choose Question Type" in Author/Question Type screen and click on "Edit/Delete".